In today's fast paced life, people have become so busy that they have no time for themselves, let alone their families. In such a situation, the end result is estranged relations among couples. This is why a lot of couples go through marital discord and require the help of marriage counsellors, advisors or marriage bureaus to work out a solution. Apart from this, the services of marriage counsellors, consultants and bureaus are availed to find suitable alliances and also for planning and organising weddings. Classified ads are the most economical kind o newspaper advertising as well as an efficacious way of taking your services to the people. Place marriage bureau ads in newspaper and effectively reach out to those couples who are in need of your assistance. 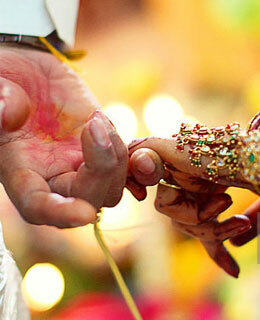 With online ad booking portals such as Bookmyad.com, you can now easily book marriage bureau ads with just a click. Bookmyad.com provides you an easy online booking system for newspaper classified ads at nominal prices. You just need to visit our website, select the category of your classified ad, and describe your needs to our team so that we provide you with the ad samples. Then leave rest of the work to us as we design the perfect ad for you. Our easy payment options allow you to pay for your classified marriage bureau ad through your debit card, credit card, net banking, cash, cheque deposit or demand draft. In case you face any issues at the time of booking, our customer support team is always at your service. You can reach us via live chat, over call or by sending an email. Bookmyad.com has tie-ups with all the leading newspapers, thus giving you a wide variety to choose from for placing your classified ad. Therefore, book your ads with Bookmyad.com and experience a hassle-free and convenient ad booking service.